Sriracha, that now-ubiquitous spicy red sauce with the rooster on the bottle, is one of our all-time favorite things. 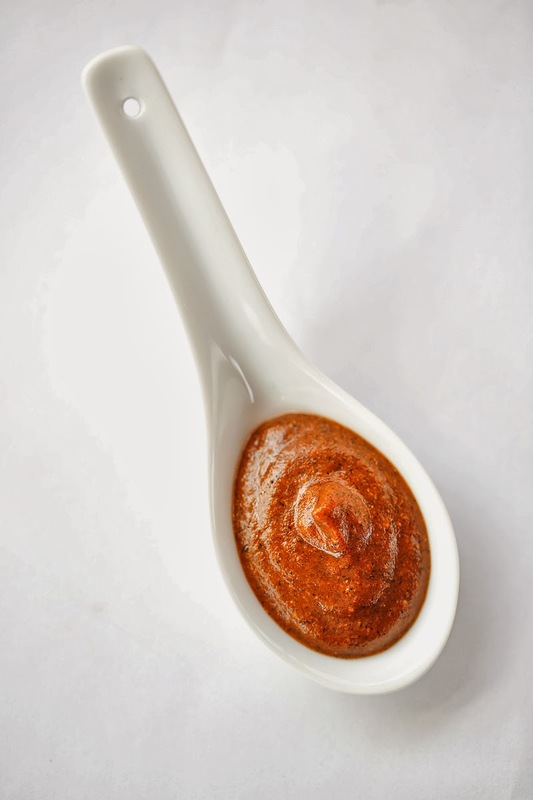 We use it in our spicy peanut sauce, on grilled corn, in soups, stews, and curries. Really, we just drizzle it on anything that needs a little flavor boost, even at breakfast! Why is this stuff so good? It hits hard on many fronts: it's salty, spicy, a little acidic, and a little sweet. In other words, it's nearly perfect. So, we messed with it, of course. 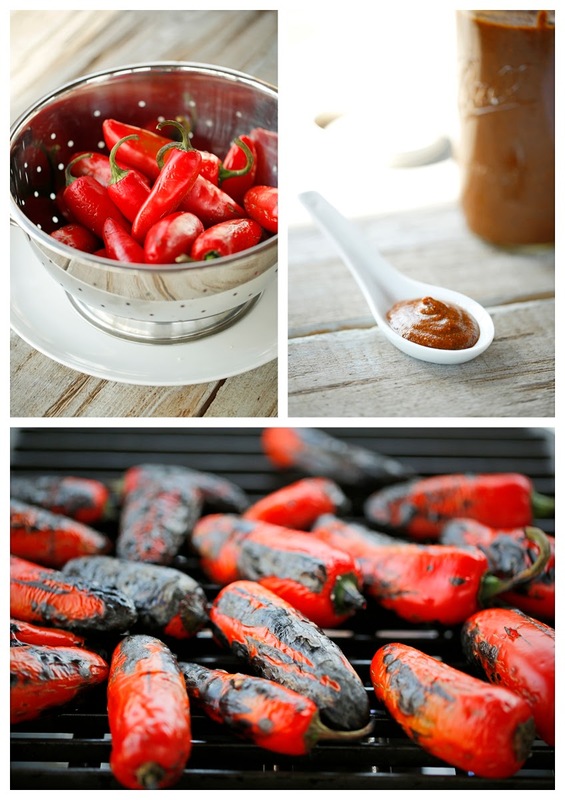 Rather than add sugar, we roasted the red jalapeños to bring out their own natural sweetness. This process also adds a nice bit of smokiness, which really ups the ante by adding an additional note to traditional sriracha sauce's symphony of flavor. This sauce is really simple to make, and the ingredients aren't hard to find. If red jalapeños aren't available -- I usually find them at the Asian market -- you can make a sauce that's just as delicious using green ones. The xanthan gum is totally optional. All it does it keep the sauce from separating in the fridge. If you don't add it, just stir it up before each use. The texture of oven-roasted spaghetti squash has always bothered me a little bit. It's softer than spaghetti and always a little watery. I was pondering other ways to handle this vegetable when it hit me. The way it pulls apart -- okay, humor me here -- seems similar to a brisket or pork shoulder. I started to wonder what it would be like grilled and slathered with BBQ sauce. 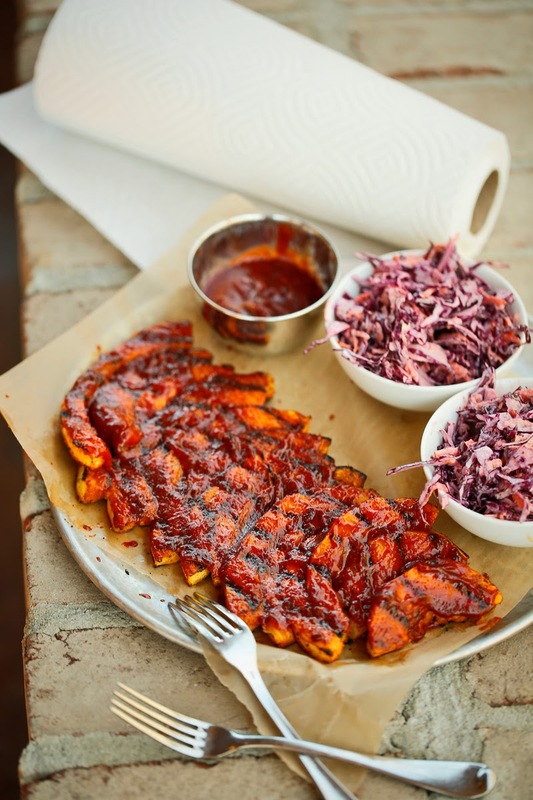 It's not an uncommon thing for this particular BBQ-loving Southerner to ponder. So, how was it? The answer is awesome…just awesome. We're calling them ribs for a variety of reasons: they're the same shape as little rib bones; it's fun to pick them up and eat them with your hands; and it's a messy good time. Seriously, this would be a fun thing to throw on the table at a party or to serve as a main dish at a picnic. People are always asking us what to serve vegetarians at a cookout. Here's a pretty cool answer. Preheat your outdoor grill to high. Using a serrated peeler or a sharp knife and plenty of caution, peel the squash. Cut the squash lengthwise and scoop out the seeds. Cut into 1/2-inch slices and discard the ends. 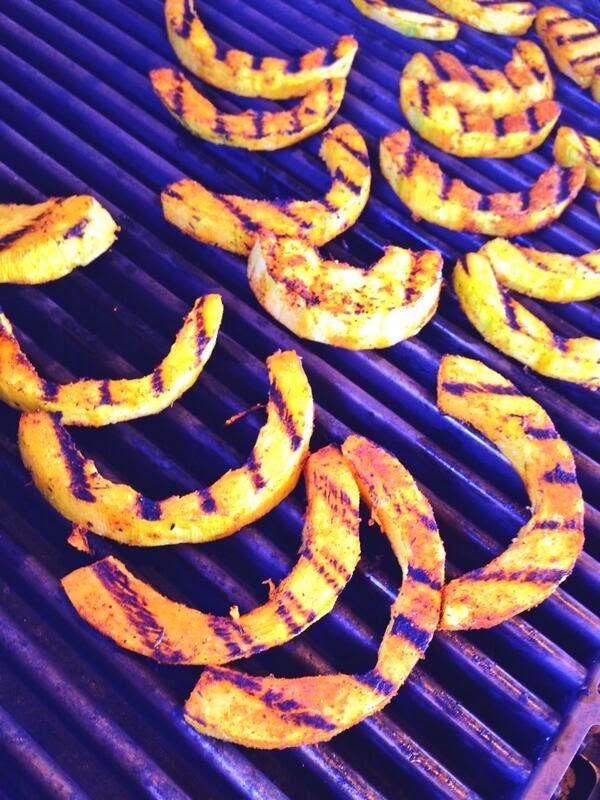 On a large sheet pan, toss sliced squash with the canola and sesame oil and then the dry rub until it's well coated. chocolate -- straight up chocolate, plain. I just don't want any interference. However, chocolate chip cookies are the exception. 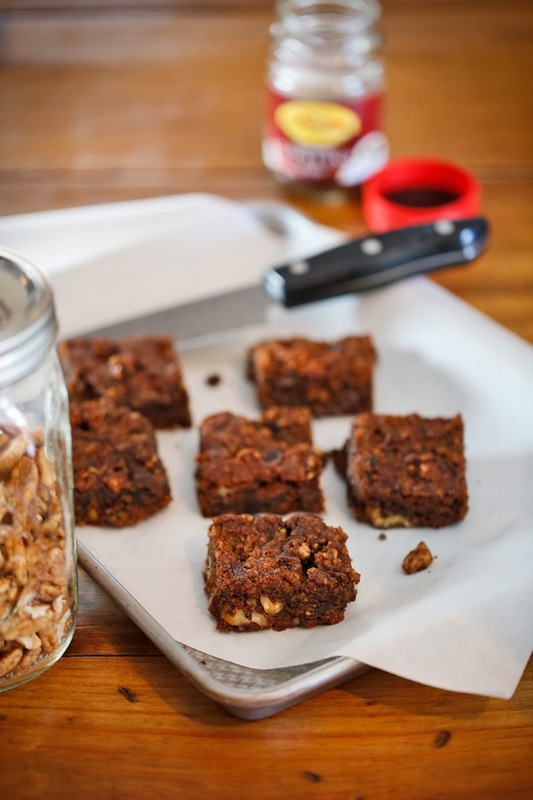 I love this whole grain chocolate chip cookie recipe, and I grew up using the recipe on the back of the chocolate chip bag, but this bar recipe is something different. We have been dying to make this type of just-a-vehicle-for-the-chocolate dessert a bit healthier, less traditional, and easier to digest. We have been baking differently this year, and we are so excited to share this new way with you. Now go find some chocolate for these. 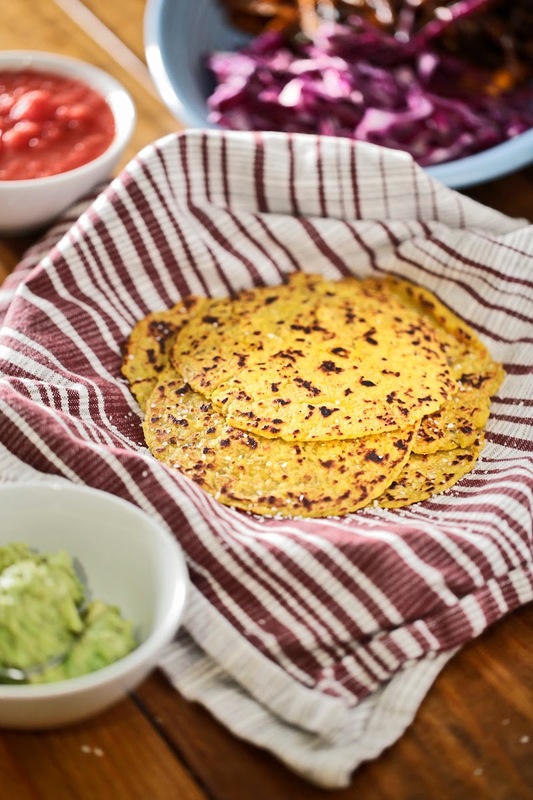 These plantain tortillas have so much to offer to those looking for a good, simple, healthy replacement for standard flour or corn tortillas. This is it! We actually made a version of them back in 2010 just for fun. This was way before we knew anything about gluten-free or paleo diets. Now, though we are not strict on either of those fronts, we do appreciate the challenges that people who chose to or have to follow a specific diet may face. We love to come up with easy, do-able solutions for you. This is so simple. 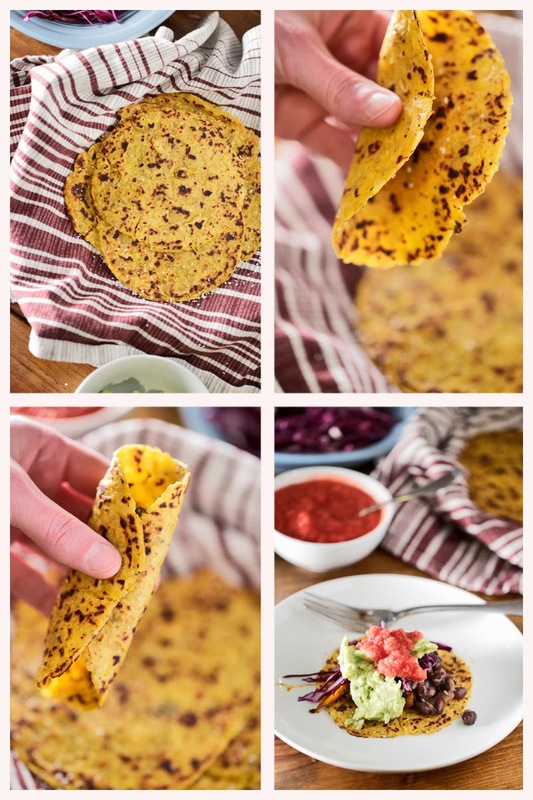 If you've ever made your own homemade tortillas, you are halfway there. The two secrets here are using ripe plantains, which look a little like large rotten bananas, and using the paddle attachment of a stand mixer to mash them rather than just blending them. Once you have the mashed plantains, you use them just like any masa or flour tortilla dough. The best part is that they act just like flour tortillas. You can bend them and stuff them like a taco or roll them up for enchiladas. You'll really love their lightly sweet taste. Place plantains, water, and salt into a covered, microwave-safe bowl and microwave for 2 minutes. Allow the plantains to rest, covered, for another 2 minutes. The plantains should be soft. Add the plantains to the work bowl of your mixer with the paddle attachment in place. Beat for 3 minutes or until all the lumps have disappeared. Gather the beaten plantains into a ball. Preheat a non-stick frying pan to medium-low. Take a 15-inch sheet of parchment and fold it n half. Brush the inside with the olive oil to keep the plantain mixture from sticking. Line your open tortilla press with oiled parchment. Using a large ice-cream scoop, scoop 1/4 cup of the plantain mixture onto the parchment, fold the parchment over it, and use the press to gently flatten it to about 5 inches. Alternately, you may use a rolling pin to flatten it between the parchment. Carefully remove flattened plantain and place into the warm non-stick frying pan. Cook on one side for 2 minutes or until it starts to blister, gently flip it using a spatula, and cook the other side for about 2 minutes. You want just that medium-low heat because the plantains have a significant amount of natural sugar that will burn over higher heat. Making up our own gluten-free recipes has certainly been an amazing journey and a life-changing experience, all very similar to how it must feel to be a contestant on The Bachelor. Let's continue this lofty analogy: first, you go in with high hopes, not knowing what to expect or what will happen. Your wild expectations are soon dashed, and then you're forced to figure out what's next. You cry a lot and are embarrassed when everyone watches you spin out emotionally over this setback. Eventually, against the odds, you do find love again. This is the end of the story, the time when you know in your heart that it wasn't all for naught and it is all going to be okay. These are some light biscuits you'd never know were GF. They don't fall apart and they taste pretty great with honey. True love really can happen, y'all, even in a highly manufactured and stressful situation. This is the proof. Preheat your oven to 425 degrees. Mix baking powder, almond flour, and salt in a large bowl. Add the cold butter using your fingers to work the butter into the flour until there are no large clumps of butter. In a small bowl combine the egg and yogurt. Make a well in the center of the flour mixture. Add the egg mixture. Using a rubber spatula, fold the mixture into the dry ingredients -- but use as few strokes as possible. Using a medium ice cream scoop, scoop up a 1/4-cup portion of dough and place it onto a parchment-lined baking sheet. Repeat until all dough has been used. 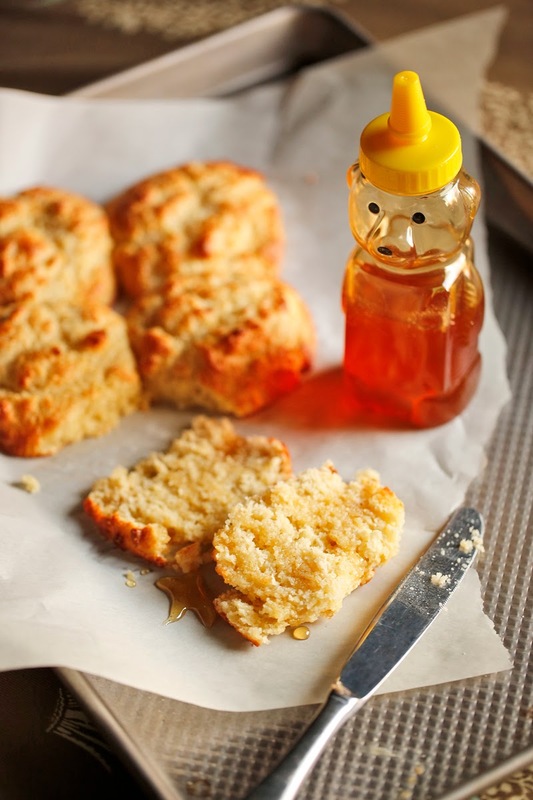 (You should get about a half-dozen biscuits from this recipe.) 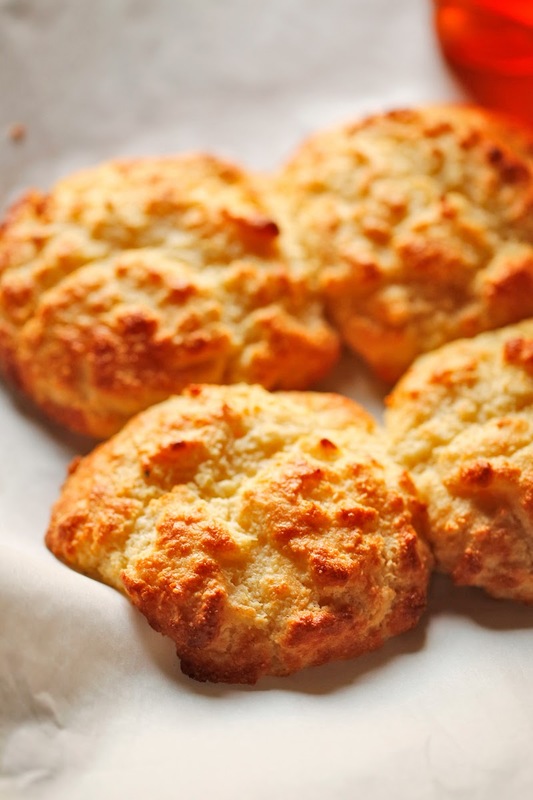 Be sure to leave an inch or so between each biscuit, but don't be too particular about their shape -- drop biscuits are supposed to be rustic. Bake for 10 to 15 minutes or until the craggy edges are brown and crispy. We've been meaning to share our recent kitchen update with you! We've lived in our house here in Memphis for eleven years at this point, and after many years of learning to cook in weird apartment and rental house kitchens with features like peeling linoleum, brown wood cabinets, slivers of counter space, and no room for storage, it's great to have a room we spend so much time in look nice. It's easy to feel a bit nostalgic now, though. 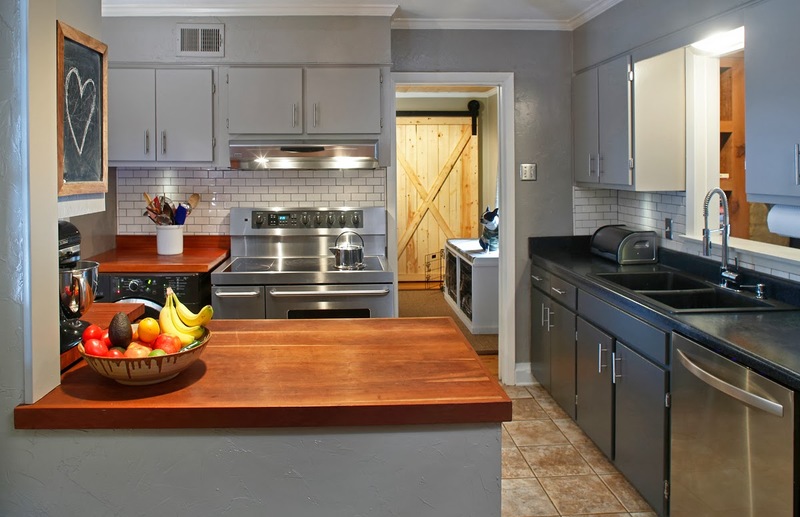 Before our current kitchen, our fourth and most long-term kitchen together was in The Belvedere Apartments on Union Avenue in Memphis, and as I type this, the building is in the midst of being demolished. We cooked our way through The Angelica Home Kitchen there, made simple spaghetti dinners for our friends, perfected our dragon bowl, spring rolls, and stir-fry, and figured out a foolproof lasagna. We cooked there for six years or so, and it's funny to remember that there was no way for two people to fit into that kitchen at one time, so any needed prep was done on the dining room table. It's probably stating the obvious to say that one doesn't need to have to have a big kitchen or a pretty kitchen to cook well. But if you like to cook, having a kitchen set up just for you is quite a joy. We spend more time here than pretty much anywhere else in the house. Seven years ago, we did the big fix, first stripping layers of red paint, orange paint, and then wallpaper and then adding a drywall texture to the busted-up walls before the fresh paint. 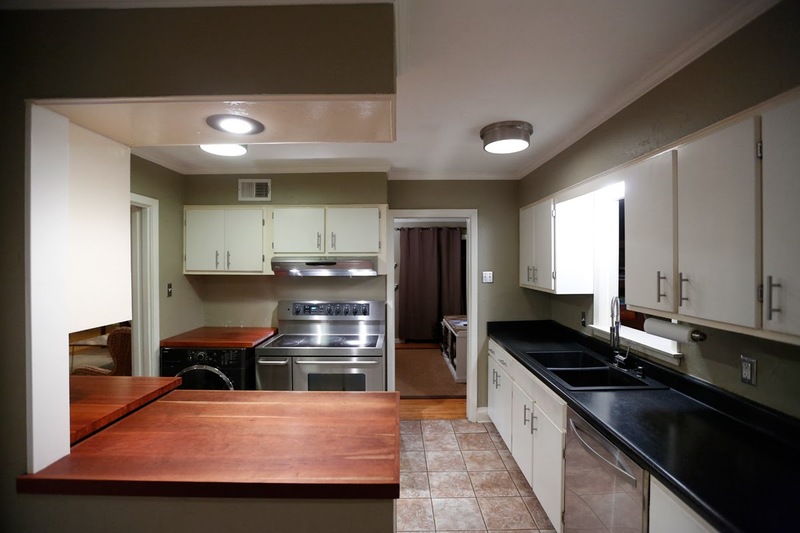 We installed basic new countertops and a cherry butcher block, replaced the 60's appliances, new cabinet fronts and pulls, new lighting and wiring, pretty much changed everything. It was our first big home project, and we learned that things have to get really messy and frustrating and gross before they get beautiful. We learned how to paint, how to do dishes in a plastic tub inside a bathtub, and how to be extremely patient. Still, there's something about destroying something tired to make it something better that's so worth it in the end. After all of the renovation craziness that summer, we didn't do much else to the place besides reorganize from time to time. We've always spent a ton of time in our kitchen, and years later, it was showing signs of wear. Broken faucet, unorganized cabinets, dingy white paint, no backsplash, lights needing rewiring -- it was time for a few improvements. We decided to go with a modern and rustic look, and we're not completely finished yet with making it look like home, but it sure is nice to work in there these days. We did the two-tone thing with charcoal gray lower cabinets and medium gray upper cabinets and walls, and cream-colored subway tile with gray grout. An inexpensive new kitchen faucet and soap dispenser combo similar to this one has been great; we've often had to replace faucets or have various parts of them repaired (probably due to how much use they get), and this one's held tight so far. Having a built-in soap dispenser on the sink for the first time in our adult lives was a serious thrill. Next, one of us added some under-cabinet lights as a Christmas surprise. Two separate projects -- organizing the spices and dedicating a cabinet to them and having pull-out drawers installed in the pantry -- also helped a lot in terms of knowing what we have at the ready and keeping like with like. 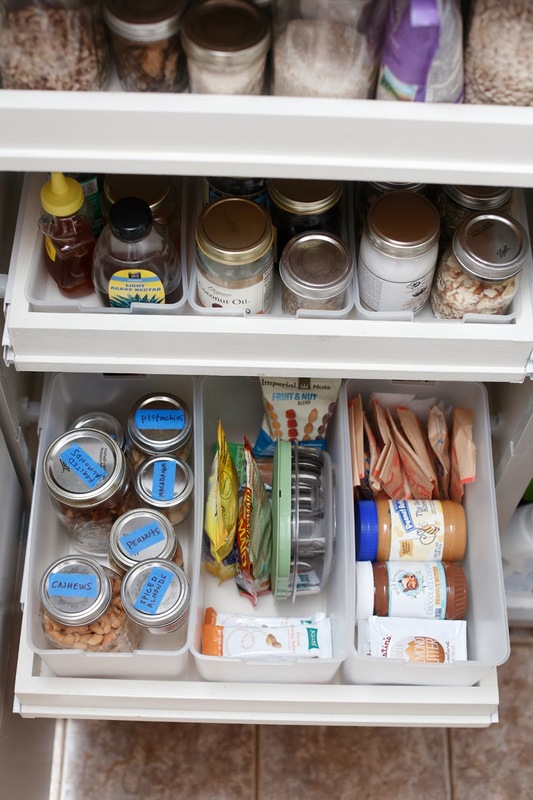 Adding a 3-bin snack drawer in the cupboard was a cool, easy addition that has probably helped us snack a little more but also helped us choose better snacks. Two cabinets just for baking items and pans and a small cabinet shelf set aside for all our coffee stuff have both made life in the kitchen a lot easier, too. We so love to cook, and it is even more a pleasure to work in this space now. We can't wait to show you what we'll create here next!